Having spent around twenty years collecting every different style of telescope I could find, before selling them all off in order that they don’t just get thrown out when I’m not here any more, it seemed appropriate to present and describe some of them in a sort of virtual museum exhibition, with photos. So the following pages describe some of the more interesting aspects of the history and function of these telescopes, for the enthusiast to read and hopefully enjoy. Eventually these will be sold on, so if you are interested in any, please ask. I can only estimate the value that I put on each of these antiques, but hopefully it will be a consistent view, having watched Ebay and other sources for many years. In 2018 sales of the telescopes have started in earnest, and some currently being actively promoted can be seen on www.fleaglass.com. I hope I can be a responsible collector. At most I have owned these telescopes for 20 years, and the average is 10 years. But most are 150-200 or even 240 years old, and work now as well as they did when they were brand new from the workshop. How many modern instruments can boast that sort of lifetime? But even so, I have only been a caretaker for these instruments for maybe 10% of their life, and it is important that they continue to be looked after for the many years of life they still have left! The ones I have collected are the few that did not sink with their sailing ships, acting as the main navigational aid on repeated journeys to Australia and the Far East: some of them were also lost by being accidentally dropped overboard, and were on merchant ships torpedoed in the war. Many were in use in the Army too, and saw service with UK forces overseas, for example in Spain, and Afghanistan (in the Indian Mutiny in the 1850s), the Boer War and in Montevideo. The most enjoyable part of collecting these telescopes is in the research about where they have been used since they were made, and, as well as who made them, who owned them, and where did they travel to, how were they used? Some of this you can now find on the internet, from home, at no cost! So it is worth also recording properly, as I hope is done here. Several have produced some surprises, and several give a false trail – for example leading to Andy McNab, and also to Robert Maxwell: (If Maxwell had had his telescope with him, maybe he would have been able to see where he was going). But those are stories for other pages. My telescope use is for spotting aeroplanes: not all of these have been used in that way, some are too heavy to lift up high! But there is also a perverse pleasure to be had in using a 17th century wooden telescope, that started life on a wooden schooner sailing to Australia, to spot a modern Jumbo jet. The main source of the historical info about the telescope makers is Gloria Clifton’s book entitled “Directory of British Scientific Instrument Makers, 1550-1851, produced in co-operation with the National Maritime Museum in 1995, ISBN 0 303 00634 6. I have to admit to finding most museums fairly disappointing in terms of their range of terrestrial telescopes, concentrating mainly on one period or type, such as the library type on a stand in the Science Museum, although I was interested to see William Faraday’s telescope in there too. The Royal Museum at Greenwich does not display its telescopes. It has 360 of them, which probably is a reasonable sized collection of Nautical and terrestrial telescopes, discounting the library ones on little stands. As at 2014 I probably only have 200 telescopes. The Greenwich collection is described in rather brief accounts on http://collections.rmg.co.uk/collections/objects/43844.html and upwards, when you get to 890 there are some Ramsdens. Another useful website is www.fleaglass.com, although the prices on there are rather high, but the quality is good. I have bought a fair number of telescopes from the London Scientific Instruments Collectors Fair, held previously at the Portman Hotel off Oxford Street twice a year maybe, on a Sunday: they have a website somewhere. One fascinating museum was that maintained by the firm Dollond and Aitchison at their Birmingham factory, which I was lucky enough to visit once: that will be reported in a story on here. But their main reference book was of considerable interest, called “Eyes Right”, by Hugh Barty-King, it presents the story of Dollond and Aitchison from 1750 to 1985. ISBN 0 907621 69 4. 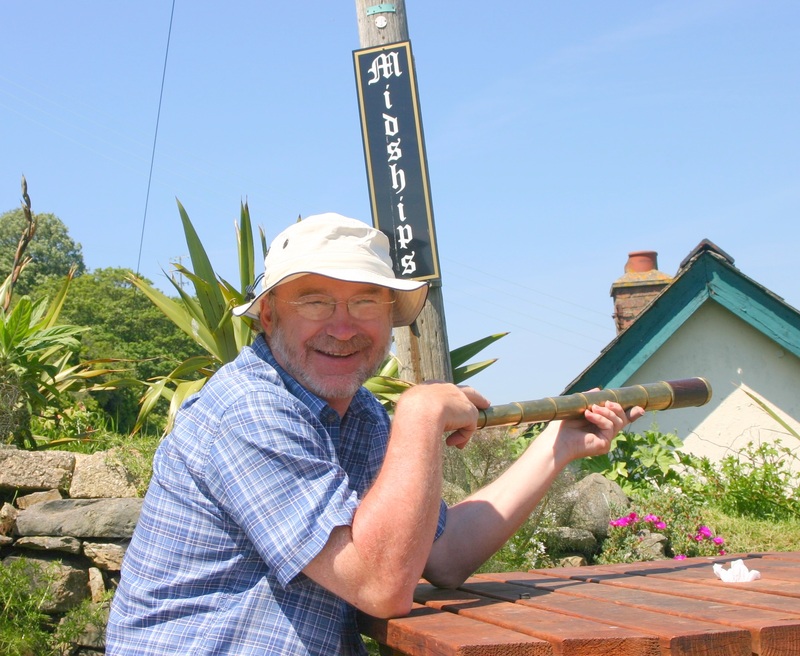 Nick Denbow, the author, with a favourite telescope for holidays, an 8-draw Carpenter, back in Cornwall: here in 2006, Midships on the Ship in Porthleven harbour. Well, true, more or less: it is at the Ship Inn…. This site and project was started in December 2013, and with a collection of around 200 telescopes to photograph and describe, it might take some time! However, if you are interested in one type or maker, please let me know, and I will see whether there is an example in the collection. (Since writing this I have managed (Dec 2016) to put a spreadsheet of telescopes by maker on here, under the title “Stock List”). Enjoy the stories, and if you wish, tell me about your telescope, and maybe that can be added here. The replies published below are somewhat typical, and were difficult to reply to, its not easy to get manufacturer’s records, and telescopes don’t tell tales, only mariners do! So without a name engraved or scratched on there, or a coat of arms, it is difficult to work it out! Plus sometimes, the engraved names don’t tally with the design, so don’t rely on them…..above all else, don’t be fooled by the low cost Indian reproductions on Ebay, where the manufacturer’s name and date are prominently engraved: they are just that, low cost repro bits, not really any use even as a stage prop. Hi, I came across your website while searching to identify the 1 I recently aquired. I can’t find much. Here’s the description, it is a wood oak lacquered and brass barrel, it is a 3 draw telescope, it is stamped ROSS LONDON with” No 1289″. When I unscrewed eyepiece there were light deposits of what looked to be salt. I was wondering if you know when It was made and if by the serial number who had it? Thanks for any help. I have a 17″ telescope, with fittings for a leather strap. It has no markings apart from small crows foot on the strap. The eye piece is black with internal slide to protect the lens. Can anyone assist with information on this. Thank you. I have recently aquired a 4 drawer telescope by J.P. CUTTS which I am trying to establish its approx date of manufacture. Inscription near the eyepiece reads in script ; “J.P.Cutts, London, Warranted”. Item is a 4 drawer approx 73.5 cm extended & 21cm closed. I have seen the same telescope advertised as a “Captains telescope” however this may only be a sales gimmick. Gloria Cliftons Directory mentions that in 1836 Cutts had an address of 3 Crown Court, Fleet Street, London and then in 1851 an address of 56 Hatton Garden, London, however this appears to be when the business existed with his sons and others. The fact that this item is only inscribed with the name J.P.Cutts might indicate the earlier date. What are you thoughts please? A friend of mine has a telescope, which I believe is a 5 drawer (shut position + 4 draws) plus an extra drawer at the end of about 5 cm. Full length is about 75 cm. The manufacturer is Gilbert & Sons, London, and marked “Improved”. Materials are wood and brass. Pics available on e-mail. As this is a family relic it is not for sale, but he would like to know more about it, and the insurance value of it. Can you please help on this? Discussed by e-mail. The insurance value was estimated as £500. I’m the lucky new owner of nautical telescope of which I know absolutely nothing about. It is a 3 draw type and is around 1 meter long. It is engraved “Made by Ja Ripley & Son Hermitage London” Could this be made by Thomas’ son James? After 1790, Thomas added and son to the engraving until 1805. I can only surmise that this could have been made by James Ripley…. ?